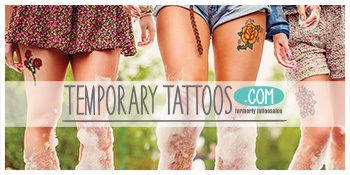 Your online resource for temporary tattoo design and inspiration! Welcome to the TemporaryTattoos.com Blog! Our favorite time of the year has arrived- Summer! With summertime upon us, most kids are out of school enjoying days by the pool and summer camp. 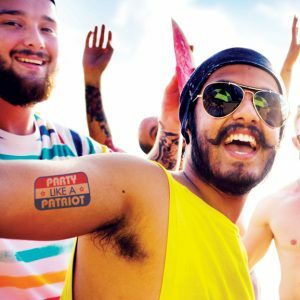 Show how you “Party Like A Patriot” with this awesome temporary tattoo! As our days grow longer and warmer we are stuck thinking, how are we going to celebrate the Fourth of July? A holiday meant for celebrating the birth of our nation, it’s important that we celebrate this holiday with style: patriot style, of course! Whether you’re staying in for a nice evening to watch fireworks, or hosting a huge barbeque we are here to help you with some patriotic inspiration for your party. Two words that go great together- food and booze. Keep all of your guests happy at your party- kids and parents included- with some simple and easy to-do’s. For that festive touch, a watermelon keg is the way to go. A watermelon keg is exactly what it sounds like: a keg that is made out of a watermelon. This is a great way to hide a boozy drink for the adults, or to put sweet lemonade in for all guests all while looking like you made that extra effort. Make your own watermelon keg for that summertime vibe! 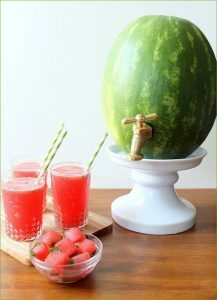 For an easy how-to on making a watermelon keg, Good House Keeping has a great tutorial. Give your watermelon keg some patriotic glam by adding our Patriotic Stars Bracelet temporary tattoo as a cute border, or the Party Like A Patriot to show that your party means business. Use the fruit from the cut up watermelon as a great snack for your guests by putting the fruit on skewers along with strawberries, blueberries, and pineapple to stick with the patriotic color scheme of this holiday. If you need a little extra Fourth of July inspiration on adults-only drinks, Cosmopolitan has a fabulous list of 39 fruity cocktails for your all of your needs. Making sure that your guests are entertained is not as tantalizing as it may sound! Show a little something extra with these patriotic tiny tattoos! Having an arts and crafts table at your party is perfect for all ages from toddlers to grandma and grandpa. Set up a few different crafts for everyone to participate in, such as a tattoo booth. 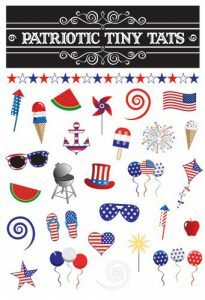 On your table, scatter a variety of patriotic temporary tattoos for your guests to show off at your party. Some great tattoos that will put a smile on your guests’ faces are our Patriotic Tiny Tats series; these tiny tattoos are perfect for that extra touch. Take your craft table a step further by adding candy into the mix. Who doesn’t like candy? Along with the temporary tattoos, scatter some red, white, and blue colored candies on your table in some cute jars- look towards M & M’s, gumballs, and Hershey’s Kisses. Also, have your guests make a bouquet of flowers, but with red and blue lollipops for the centerpiece instead of flowers! Gluesticks has a fun DIY tutorial on how to make this patriotic topiary. With the temporary tattoos already laid out on your arts and crafts table, add these tattoos to the vases that you’ll put your lollipops in as a way to add to the Fourth of July spirit. As you’re planning your guest list for your Fourth of July celebration, a fun way to make your party even more extra is by having your guests wear customized temporary tattoos! Design your own custom tattoo with some fireworks, a punny quote, or even the family name/crest. With custom temporary tattoo quantities as low as 25 tattoos (that’s plenty for your party! ), your guests will love that personal touch you added to this holiday. Even if you decide not to host a party, custom tattoos are a great little gift to pass out at your local firework display!